When were tombs first built in the Valley of the Kings? The Valley of the Kings is where many of the famous Pharaohs of Ancient Egypt were buried. Ravaged by tomb robbers the most famous of all the tombs was that of King Tut - Tutankhamun. The Valley of the Kings is a necropolis which is defined as a large cemetery or burial place near the sites of the centers of ancient civilizations. The Valley of the Kings necropolis was located near the Ancient Egyptian city of Thebes. The Valley of the Kings is located near Luxor which, in Ancient Egypt, was called Thebes. Thebes was the capital of the Ancient Egyptian dynasties during the period of the New Kingdom. Thebes stood on the eastern bank of the River Nile and was the centre of worship for the god Amun. Opposite Thebes, on the Western bank of the Nile, is where the Valley of the Kings is located. The Valley of the Kings is is set in the area of the Sacred Theban mountain which was revered as sacred land of the Kingdom of the god Osiris, the Lord of the Afterlife. The Theban Peak is a natural pyramid-shaped rock which overlooks the Valley of the Kings and this must have contributed to the reasons why this area was chosen as the royal necropolis. The Ancient path leading to the Valley of the Kings, where the modern road now lies, was called the 'road where Re sets'. The road divides into two directions but only 4 tombs, including the royal tombs of the Pharaohs Amenhotep III (aka Amenophis) 1389BC -1351BC and Ay 1325 -1321BC, are located in the Western Valley. The main branch of the road leads to the Valley of the Kings and the other 58 tombs to be found in this area. Tombs for royalty and nobles were built in the Valley of the Kings during the period of the New Kingdom (1570 BC - 1070 BC) and served as burial places for people of great importance during the 18th - 20th Egyptian Dynasties, a period of 500 years. The tombs are hollowed in the rocks of the Theban mountain. The table below provides a list of all of the tombs which have been discovered and excavated in the Valley of the Kings together with the names of the Egyptologists who excavated them. But before the modern excavations people were aware of the tombs in the Valley of the Kings. In 57BC the Greek historian, Diodorus Siculus, wrote about the tombs in the Valley of the Kings. The tombs were visited by the Greeks and the Romans who left graffiti on the walls of the tombs in Greek and Latin which is still visible today. The next documented evidence regarding the Valley of the Kings is by a Jesuit priest called Claude Sicard (1677 – 1726) who rediscovered the Valley of the Kings between 1708 and 1712. A plan of 18 tombs in the Valley of the Kings was then drawn by an English clergyman called Richard Pococke (1704-1765) in 1734. James Bruce (1730 - 1794), a Scottish Egyptologist, explored the tomb of Ramses III in 1769. In 1798 Napoleon Bonaparte led a military campaign into Egypt. The French were in Egypt for 3 years when they studied Egyptian monuments and history. The discovery of the Rosetta Stone sparked even more interest in the Ancient Egypt civilisation and excavations in the Valley of the Kings began. The Valley of the Kings was visited by noted Egyptologists such as Giovanni Battista Belzoni, James Burton, John Gardiner Wilkinson, Jean-Fracois Champollion, Robert Hay, Victor Loret and Howard Carter. 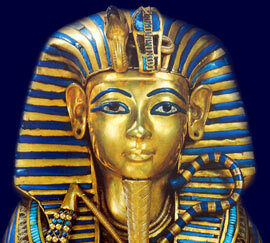 There are 63 tombs which have been discovered in the Valley of the Kings. However these tombs do not just belong to the Pharaohs, the Kings of Egypt - only 24 tombs in the Valley of the Kings are royal tombs. The remaining 38 tombs house the burial places of leading dignitaries or the 'Tombs of the Nobles' and even animals. Each section of the Valley of the Kings addresses all topics and provides interesting facts and information about the Golden Age of Pharaohs and of Egypt. The Sitemap provides full details of all of the information and facts provided about the fascinating subject of the Pharaoh - Tutankhamun and the Valley of the Kings!